Newport County have seen their push to feature significantly in the battle for promotion out of League Two this season stall somewhat in recent weeks. A 2-1 win over Crawley in January saw the Exiles in ninth place, but just four points off the automatic slots, and only two away from the play-offs. They followed that up with a 1-1 daw against Morecambe, before their next 1-1 draw caught the eye of the footballing world, as it came at a packed Rodney Parade versus Premier League giants Spurs in the FA Cup, the visitors needing a late Harry Kane penalty to force a replay. That then led to a run of four straight defeats, as County lost to Lincoln (3-1) and Colchester (2-0), defeated at Wembley 2-0 as they bowed out of the FA Cup, before being battered 5-0 at Mansfield. Michael Flynn’s side stopped the rot with back to back stalemates against Notts County and Port Vale, as they were then held in a thrilling 3-3 draw at Forest Green Rovers, making it nine games without a win. However, that long search for a victory was finally ended last weekend as Yeovil were defeated 2-0 at Huish Park, meaning County now sit in 11th place, six points adrift of the top seven, although a hefty 13 away from third placed Notts County, with 10 games of the season remaining. 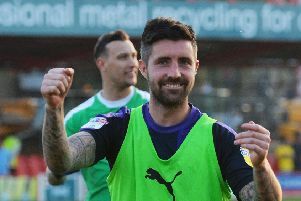 Flynn believes that the spirit within the camp will count for something as he looks to finish above the dotted line, telling the club’s official website: I think I said at the beginning of the season that the right mentality and the right togetherness can get you 10 points a season. “It’s something we’ve got here – it’s pulled us through in some games where it might not have in the past. And it’s kept us together when things haven’t gone our way i.e. losing 5-0 at Mansfield. The hosts have struggled at home of late too, with Exiles supporters not being able to cheer a victory for the last four matches since that triumph over the Red Devils. With Luton also winless in their last four matches to lose top spot to Accington, Flynn has urged his side to continue the Hatters’ tricky period, saying: “They’ve been top of the table all season but have had a little bit of a wobble. “Everybody has a wobble. They haven’t won in four and it’s a crisis here when that happens so imagine how they are feeling with the size of their budget. “The pressure is on them I think. There’s no pressure on us, we’ve already got more points than we did last season. Team news: Luton have virtually a clean bill of health for the trip to Newport with only Lawson D’Ath unavailable due to a knee injury. Newport have the luxury of a fully-fit squad to choose from as Scot Bennett returned from a hamstring injury last weekend and striker Frank Nouble is available after the birth of his daughter. Top scorers: Hatters: James Collins (18). Exiles: Padraig Amond, Shawn McCoulsky (11). Milestones: Glen Rea completed his 100th appearance for the club during Tuesday night’s 2-2 draw at Coventry City. Man in the middle: Craig Hicks - official has taken 31 games this season, showing 107 yellows and four reds. Had the Hatters just last month, when Town saw off Crawley 4-1 at home, while also refereed the 2-2 draw with Spurs U21s in the Checkatrade Trophy back in August. First season in the Football League after spending four seasons in the Conference. In charge: Michael Flynn – 37-year-old who was born in Newport and started his career with his hometown club before heading to Barry Town and Wigan Athletic. Spells followed with Gillingham, Blackpool, Huddersfield, Darlington and Bradford before returning to Newport in 2012. Became director of the club’s youth academy in May 2014, leaving for a short time in June 2015, as he rejoined as first team coach in October, and then became football and business development director. Was on the coaching staff once more in October 2016 under Graham Westley, named caretaker boss in March when he departed and led the club to survival last season, appointed permanent manager in May on a two-year contract. Friendly faces: Defender Mark O’Brien joined Newport in January 2017 after mutually agreeing to terminated his deal with Luton having played just nine times for the club. Featured 47 times for the Exiles since, scoring once, with that goal one of the most important in the club’s history, coming in the last minute of a dramatic final day 2-1 win over Notts County last season to ensure Newport stayed up. Tricky winger Robbie Willmott was snapped up by Luton for 50 from Cambridge in January 2011 playing 67 games and scoring 15 goals for the Town. Went back to Cambridge when released in July 2012 and then had a spell with Newport, playing almost 100 games for the Exiles over two years. One to watch: Paul Hayes - veteran striker who signed for Newport in October after seeing his three year stint at Wycombe come to an end. Registration regulation meant his debut was delayed until January, as he didn’t score in his first five appearances for the club. Off the mark with a double in the 3-3 draw at home to Forest Green recently and followed that up with a goal in the 2-0 win at Yeovil on Saturday to make it three in two. Now 34, Hayes has played for a host of clubs including Barnsley, Scunthorpe and Charlton in his career, just shy of 150 goals in over 500 games. Played for both: Charlie Henry - diminutive winger who was in Luton’s academy before being released and had spells in non-league at Arlesey, Cambridge City, Dorchester and Havant & Waterlooville before Newport signed him in 2009. Spent two years County, scoring 11 goals in more than 50 games, including at Kenilworth Road during a 1-1 draw in August 2010. Joined the Hatters on loan in November 2010 and made the move permanent, but a serious injury prevented him from ever making a full impact, restricted to just six appearances in total. From Luton went to Macclesfield, Whitehawk, Chelmsford and even Team Wellington in New Zealand, before playing for Dunstable Town once more in recent seasons. We’ve got form: Hatters have never been the best travellers to Newport since they began with a 5-1 Southern League defeat back in 1913. Over the years, they have won eight, drawn eight and lost 15 of their 31 trips, scoring 41 goals and conceding 58. They did enjoy three wins in a row during 1934 and 1936, but have shipped five twice, the most recent being in December 2012 under boss Paul Buckle, while also were thrashed 7-2 in a Division Three South reverse during March 1928. Town haven’t left with three points on their last five visits either, with the Hatters having to go back to Danny Crow’s last minute winner in 2011 for their most recent victory. Last time out: Luton were held to a 1-1 draw at Newport County last season. The visitors got off to the perfect start when Danny Hylton was brought down in the area after five minutes and got up to convert the penalty. However, Newport levelled just before the half hour when Sean Rigg’s free kick deceived Matt Macey and went straight in. Hatters: Matt Macey, Stephen O’Donnell, Johnny Mullins (Olly Lee 67), Scott Cuthbert, Glen Rea, Alan Sheehan, Jordan Cook (Jack Marriott 77), Pelly-Ruddock Mpanzu, Danny Hylton (James Justin 46), Isaac Vassell, Ollie Palmer. Subs not used: Stuart Moore, Akin Famewo, Jonathan Smith, Lawson D’Ath.